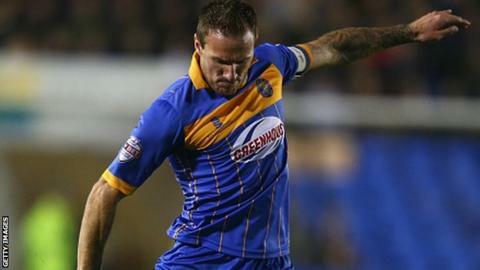 Liam Lawrence's 95th-minute penalty completed a second-half comeback for 10-man Shrewsbury away at Dagenham. Billy Bingham opened the scoring after five minutes, and the Daggers' position was improved when Jermaine Grandison saw red for pulling down Ade Yusuff when he was through on goal. Andy Mangan, who scored against Chelsea in midweek, then equalised on 70 minutes before earning the spot-kick. Dagenham remain in 21st, three points above the bottom two. "We started the game very well. I think we were on the front foot. "I wasn't happy when their player got sent off, I felt it changed the game. They raised their game and we took the back foot and gave them the initiative. "When you're losing games you can become a little apprehensive, a little bit nervous and a little bit anxious - and we showed that. "Their first goal was a great finish but their second goal was just comical defending." "I think the most satisfying thing as a manger is that even though we had so many setbacks in this game, we believed in what we could do and we trusted the players to find the energy levels to win the game. "We had a tough game in midweek against Chelsea and to have that determination to win the game today is great to see. "The goal to equalise was sublime as their goalkeeper has made six or seven outstanding saves. You know with this group of players they will not give up easily. "I do not think we had a bad first half. We tried to play football, we kept to the plan and we are satisfied with what we have done. "We can take great satisfaction to be in the top three, but the job is not done. "We have had a lot of physical pressure the last few weeks. This week is all about recovery so we are ready for a special cup tie away at Walsall next Saturday." Match ends, Dagenham and Redbridge 1, Shrewsbury Town 2. Second Half ends, Dagenham and Redbridge 1, Shrewsbury Town 2. Substitution, Shrewsbury Town. Anthony Griffith replaces Liam Lawrence. Substitution, Shrewsbury Town. James Wesolowski replaces Bobby Grant. Goal! Dagenham and Redbridge 1, Shrewsbury Town 2. Liam Lawrence (Shrewsbury Town) converts the penalty with a right footed shot to the bottom right corner. Penalty conceded by Scott Doe (Dagenham and Redbridge) after a foul in the penalty area. Penalty Shrewsbury Town. Andy Mangan draws a foul in the penalty area. Corner, Shrewsbury Town. Conceded by Mark Cousins. Attempt saved. Ashley Chambers (Dagenham and Redbridge) right footed shot from outside the box is saved in the centre of the goal. Attempt saved. Andy Mangan (Shrewsbury Town) right footed shot from the centre of the box is saved in the centre of the goal. Corner, Dagenham and Redbridge. Conceded by Jack Grimmer. Attempt blocked. James Collins (Shrewsbury Town) right footed shot from outside the box is blocked. Foul by Rhys Murphy (Dagenham and Redbridge). Attempt blocked. Rhys Murphy (Dagenham and Redbridge) right footed shot from outside the box is blocked. Hand ball by Andy Mangan (Shrewsbury Town). Billy Bingham (Dagenham and Redbridge) wins a free kick in the attacking half. Liam Lawrence (Shrewsbury Town) wins a free kick in the attacking half. Foul by Ashley Chambers (Dagenham and Redbridge). Substitution, Dagenham and Redbridge. Rhys Murphy replaces Ade Yusuff because of an injury. Attempt saved. Liam Lawrence (Shrewsbury Town) right footed shot from more than 35 yards is saved in the centre of the goal. Corner, Dagenham and Redbridge. Conceded by Mickey Demetriou. Substitution, Dagenham and Redbridge. Ashley Chambers replaces Jamie Cureton. Goal! Dagenham and Redbridge 1, Shrewsbury Town 1. Andy Mangan (Shrewsbury Town) right footed shot from the right side of the box to the top left corner. Assisted by Jack Grimmer. Scott Doe (Dagenham and Redbridge) is shown the yellow card. Liam Lawrence (Shrewsbury Town) is shown the yellow card. Foul by Liam Lawrence (Shrewsbury Town).